India and New Zealand locked horns at the Westpac Stadium, Wellington on Sunday afternoon with the hosts looking to gain some momentum before the T20 series. But Team India kept their cool and defeated New Zealand by 35 runs in the final ODI of the series, winning the series 4-1. New Zealand started off well with the ball by sending back the openers to the dugout before they could reach double digits. Soon Shubman Gill, India’s newfound talent, met the same fate. Things got more worse for India when MS Dhoni was cleaned bowled by Trent Boult and India were reduced to 18 for the loss of 4 wickets in the 10th over. However, Ambati Rayudu and Vijay Shankar had different plans altogether, and their 98-run partnership ensured that India got out of danger. Kedar Jadhav’s mature innings and Hardik Pandya’s cameo in the final overs ensured that India crossed the 250-run mark. Replying to the visitors’ score of 252, the hosts got off to the worst possible start and were tottering at 38-3 inside 10 overs. Kane Williamson’s slow innings and Ross Taylor’s early dismissal added insult to injury. James Neesham’s rollicking knock kept up the hopes for the Kiwis, but he was run out owing to his carelessness in the field. The win provided India some much-needed momentum which was lost during the fourth match where India got bowled out for just 92 runs. 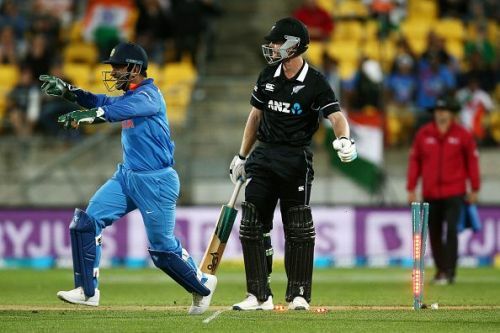 With the lopsided series scoreline India also got revenge for their last New Zealand tour, where the visitors were whitewashed in the ODI series 4-0. As for the Kiwis, the return of Neesham to the side and Boult gaining some form are the biggest positives from the series. After silencing his critics on the Australian tour by scoring a hat-trick of 50s, Dhoni continued his form in the New Zealand series. But due to a hamstring injury he missed the third and fourth ODIs. In the 5th ODI Dhoni scored just one run before he got clean bowled by a perfect in-swinging delivery from Boult. But while the critics were ready with their keyboards to write "Dhoni should retire", he pulled off a magnificent run-out thanks to his great presence of mind on the field. That run-out proved to be pivotal in the result of the game, and told us how Dhoni is still an asset to the Indian team.